May | 2012 | what? bread? This is the third in the Mellow Baker’s selection for May 2012 from Dan Lepard’s The Handmade Loaf. Contents: water, rye leaven, fresh yeast, soaked and cooked rye grains, salt, light rye flour. Being a natural sceptic I only used half the ingredients that the book suggested, just to see how it went. I diverged from the recipe also by just cooking the grains and soaking them in the cooking liquid, maybe they would take on something from some ale as suggested in the book. It also took forever to rise on Sunday, which was not a warm day, so rather than the 2 and half hours suggested, it was in the kitchen for about 5 or 6 before I gave in and put it in the oven. Also, I couldn’t find a brown paper bag, so it has been in some baking parchment snuggled up in the bread bin. Actually, it went OK, but it does still look a lot like a mesopotamian mud brick. It smells a bit like pumpernickle, which it obviously shares ingredients with, and would go well with strong tasting things as suggested like stinky french cheese. 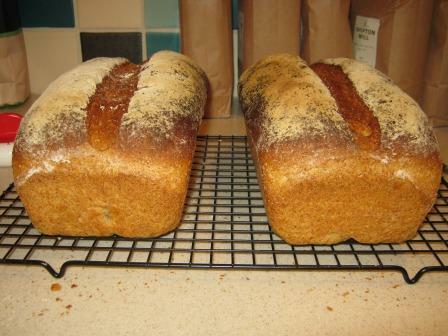 This is the second of May’s Mellow Bakers bakes from Dan Lepard’s The Handmade Loaf. Guess what? No yeast! Not being sure that the family would think much of these I opted to do a half of the stated ingredients, although I did a whole lot for the spices as there wasn’t a lot to do. More anon. So we have: spices – coriander seeds, cinnamon, nutmeg, black peppercorns, ginger, cardamom and fennel seeds. Ground up with a mortar and pestle, on balance I think I’d just use ground coriander next time, (as an aside I have a carrot cake recipe that calls for coriander and doesn’t state what type – when given to a colleague at work to try she used live green coriander, I just use the ground powder stuff). The recipe for the wafers doesn’t say what to do with the cardamom pods so I just took out the black seeds and pounded them in. Being a multi-tasker I left the honey and butter melting together while I did the pounding and added sorted out the dry goods and then added the cream to the honey and butter. On the subject of honey I must admit to using the cheapest I could find for this trial run, which was from Morrisons and barely tastes of honey or anything very much. I think if you could afford a decent, strong honey that tastes of flowers then this recipe would be absolutely fantastic. Dry goods: plain white flour, light rye flour (from my stash of Shipton Mill), bicarbonate of soda and soft brown sugar (I used the light type, but I think using a darker type might also bring some extra depth to this. Then it goes into the fridge for a bit. The recipe calls for 2 hours, I just gave it an hour at the bottom of mine in a plastic bag. Rolled out, cut with a 7.5cm cutter (the nearest to the 8cm required that I have). Placed on baking paper then glazed with beaten egg, again I diverted from the instructions here because it calls for one whole egg plus an egg yolk and as I was only doing a half I opted out of this and just did a single egg and a big pinch of salt. This made a total of 12 full size pieces plus a half sized bit of the final scraps. Would I do this again? Definitely, even my son said they were delicious, although he was quite suspicious to start with. And my husband said that mine looked better than the ones in the book! He must be after something. I think that it would be interesting to change the type of honey and the sugar and the flours because the results would be different every time. 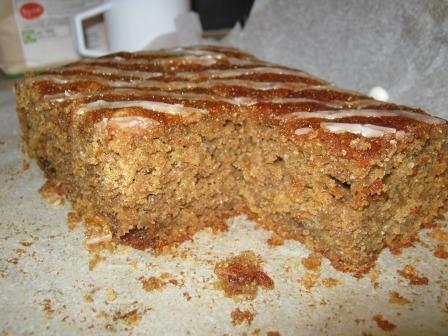 I also have my eye on a Hairy Bikers gingerbread recipe which I will trial for comparison at some point. This is my first Mellow Bakers bake for May, and the fourth in the series. Ingredients – soft white flour (I used Shipton Mill soft flour for cakes and pastry), milk, yeast, salt, butter, ricotta, big sprig of rosemary out of the garden. First stage is to make a ferment with the milk, half of the flour and the yeast. It then rests for an hour and then you mix in the other ingredients leave for 10 mins and do the Dan Lepard knead, leave for 10 mins, three times in total. 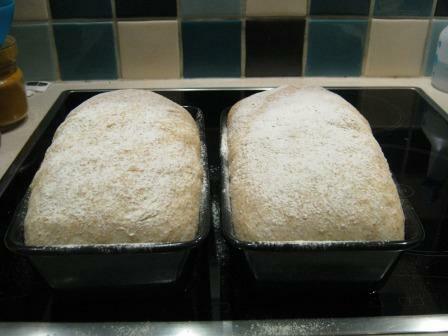 As you may be able to see from the pictures below it was very sticky at the first mix and first knead. Tthen it said ‘Then leave the dough for 1 hour, kneading it once more during that time.’ Which I took to mean leave for 30 mins, knead, leave for 30 mins. Then you roll it out, I patted it out by hand, you slice it up thinly and roll on the worktop, then place on trays and put them straight into the oven. I think I baked them all about 5 mins longer than the recipe said. The texture is more pastry-like than crunchy breadstick because I used soft flour. But they are very moreish, the rosemary is significant but I’m not over sure that I can taste the cheese and I’ve eaten loads! Not sure I’d bother again, maybe for a party but a bit fiddly. Also, they remind me of a tray of bones. Back in another life I was an archaeologist and I’ve seen plenty of finds trays full of animal and human ribs or arm bones that look just like these.